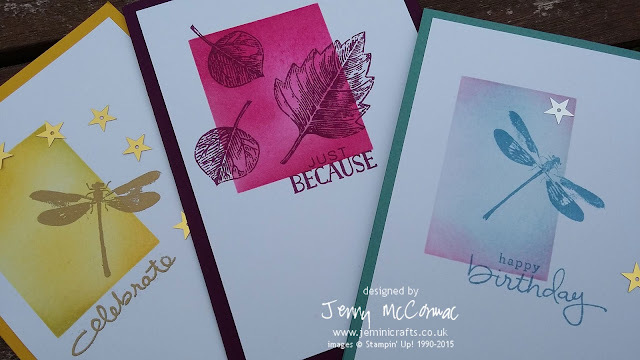 Following my posting yeserday where I showed you the card designs for my All Occasion Card class this month; I managed to make a few more cards yesterday evening, with more of a summer colour palette. Here are the finished designs - I chose just one of the cards to re-create, but loved the way they came out. This masking technique is so easy to do and requires little extra supplies. I have swapped out the Autumn leaves for the summer Dragonfly. You can't see too well from the angle of the photo, but the dragonfly and the sentiment on the yellow card is heat embossed in gold. You may also have spotted more loose sequins too. Where are the directions for these cards? I though the previous day said it would be on the next post but I don't see it.